10-16-17 Your Highest Cost of Doing Business? People. Guest Jim Blanchard. If you liked this show, you should follow David Lykken. What is your highest cost of doing business? How to find the right ones, how to make them productive, how to keep the best. We can help! What behaviors are you hiring? What behaviors do you want to hire? How will your new hires fit in the team they join? How will you align them with your culture and their team mates? How do your employees learn? What motivates them? How can you manage them for maximum engagement and productivity? How do you smooth cross functional behavior between sales, operations, underwriting to reduce friction and get the loans out the door? Listen on Monday, October 16, while David and Jim Blanchard discuss how The Birkman Method with behavior based position descriptions can help with all of this and more. 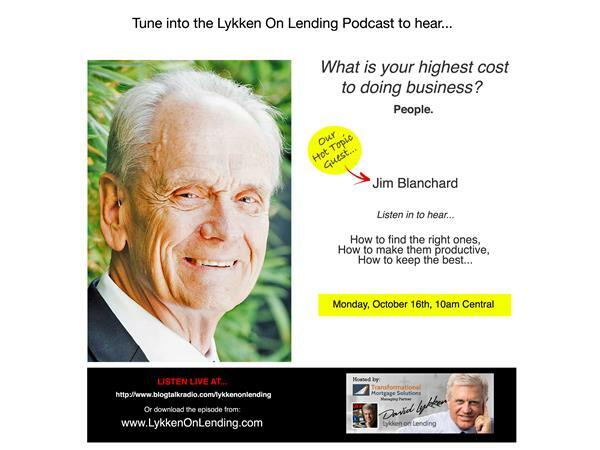 Check out this podcast for exciting topics like these and more when we talk about the Birkman Method with Jim Blanchard.